Optimize Pulse: Speaking, Creating, Optimizing… Winning! Thing I Carry began as a LinkedIn special feature, with influencers like Deepak Chopra and Richard Branson sharing the must-have items in their toolkits for success. Optimize author Lee Odden shares his own Things I Carry presentation, consisting entirely of photos and imagery from his own Instagram account. 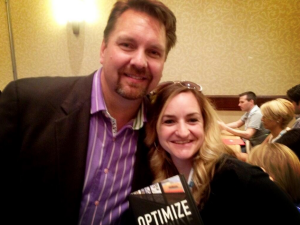 Attendees Rachael Silvers and Isaac Wardell each won a copy of Optimize for their tweeting prowess during Lee Odden’s blogging and content marketing presentation last week at Social Media Marketing World 2013. During Lee’s session, his incredibly active audience shared close to 300 tweets packed with digital marketing advice for their networks. SAP’s Michael Brenner recently interviewed Lee Odden on how the increasingly connected consumer will change the roles of marketers. With 50 billion connected devices, marketing will inevitably evolve, but what will that look like, he wonders? See the full interview on the SAP Blog. 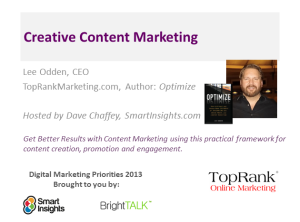 Lee Odden’s recent webinar with Smart Insights is now available to view on demand. This presentation shared a practical framework for creative and efficient content creation, leveraging a content mix that attracts, engages and converts new business. Companies must use the right approach to content marketing strategy, since otherwise developing creative, workable ideas for effective content marketing can be a challenge that wastes time and money. See the full webinar recording for more. Mel White from ClickZ interviews Optimize author Lee Odden on the top three pieces of advice attendees took away from his SES New York presentation, Creative Content Marketing: Winning Hearts, Minds & Wallets. Odden also shared an example of a brand winning in its approach to content marketing, alongside another that makes him cringe. Check out the @toprank Twitter channel and the #whatthefoc hashtag this Wednesday, April 17th, for live tweets from MIMA, as Lee Odden discusses The Future of Content with Minnesota marketers.